1. Visit http://gw.igg.com/main.php and then click the "Login" button at the top of the page. 2. Click "Facebook" in the pop-up panel and then login with a Facebook account. 3. 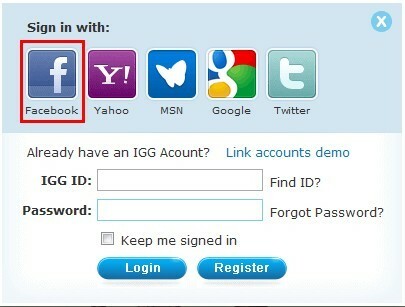 Click the "Account" button at the top and then click "Linked Accounts", or simply visit http://passport.igg.com/account/linkaccount.php. 4. 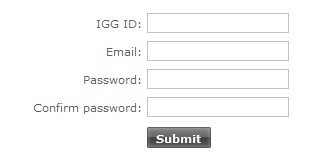 Enter the required information of an IGG account, and at last click the "Submit" button. 5. After you bind the accounts, you also need to activate the access to GodsWar Online. This tutorial is suitable to players on the Olympia server. When you finish binding a Facebook account with an IGG account, it won't take effect unless you enter game or re-enter game (if you are in game when you bind the accounts) 10 minutes later. Once the binding takes effects, you will be able to use the IGG account to win IGGems, GWO Credits, event benefits and more from the IGG official website for the Facebook account.